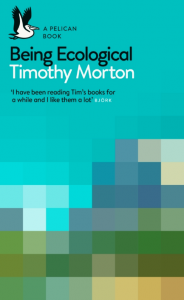 I've just reviewed Timothy Morton's Being Ecological for the Guardian. It's the first of a regular series of non-fiction reviews I'll be doing for the new-look Review section. I'll also be reviewing paperbacks as usual, so there will be plenty of fascinating non-fiction titles to choose from in 2018. Happy reading! Morton's book is full of remarkable insights and ideas - it's a brilliant and only occasionally Delphic display of intellectual pyrotechnics. He doesn’t offer a plan to make society more environmentally friendly: “the idea of sustainability implies that the system we now have is worth sustaining”. Instead, in what is an inspiringly idealistic book, he wants a paradigm shift in our relationship to the world and for us all to live the idea that we are “a symbiotic being entangled with other symbiotic beings”.